I am a self taught textile artist. My obsessions are colour, texture, sumptuous vintage silks and brocades and all that glitters and shines. I was brought up in New Zealand, surrounded by Polynesian art, Catholic imagery, the lush foliage of the rain forest and the imported kitsch of Hollywood movies of the 1950s. As an adult I moved to London and began to recreate these images as figurative pieces, art coats, hangings and sculptural fabric vessels. My embroideries and collages are roads to imaginary travel. 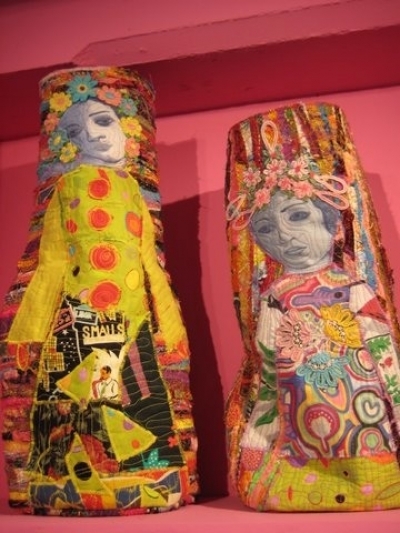 I am fascinated and inspired by folk art from all over the world ( I have travelled and collected for most of my life). My sculptured fabric figures have developed from my love of tribal art, goddess mythology and my passion for the feminine.